Then suddenly that OMG moment hits all us moms like a cry for help. .. “what are you doing for summer with your kids?” we ask one another with blank stares, zombie-like at the thought of our all our brood home, full-time. A look of desperation crosses our faces…summer. Summer! Summer!!! It’s like the uncharted territory of the Bermuda triangle; we’ve all been there before yet it seems a frightening reality that we can’t quite being ourselves to face.I begin making plans and even begin to look forward to nothing on the schedule. I write out the first week or two of summer break. I order Summerbridge workbooks in advance. I even have grand visions of charts, lists, extra chores, and even making the kids do typing lessons online. With no practices to run to and no homework time to enforce, my mind begins to wander to all the free time I might have. Maybe I can watch a few movies that aren’t from kid’s section on Netflix. Maybe get a scrapbook done or organize a closet or two. Later meals and bedtimes are in order. While having a schedule keeps me sane some of the time, during summer, I continually forget that letting go of the schedule and routine does us so much good. We connect with one another without confines of time; we rejoice in Mariocart races, we eat breakfast at 9:30am; we stay in our PJs until noon. We wear nothing but swim suits all day. Something happens about half-way through the summer: I begin to let go and start to have fun. I relax and get off the “hyper-organized mom train.” I begin to embrace the messy playroom floor and shouts emanating from upstairs as the kids cheer each other on playing Wii. I relax. We relax. We enjoy lots of playtime a friends’ pools, the waterpark, the amusement park. As we all get in the groove, the kids begin playing well together. .. finding games to play they never played before like “stuffed animal zoo hospital” and “royal Barbie fashion designer families.” My older kids read books–all day. 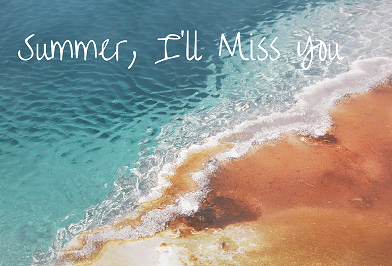 Just when we get the hang of this thing called summer, it has come to an end. No more trips to the waterpark on a Monday morning. No more shopping at Costco with all four kids (okay, I’m really happy about this one). We know how to relax and get along (save the daily bickerings about cartoon selection or who’s turn it is to do what) and then it comes to a close just as we’ve tackled this summer thing. For me, there’s been a bittersweet light at the end of the tunnel: After nearly 12 years of having a toddler at home, my youngest of four has started kindergarten. My oldest has started middle school. Transitions are hard for me and my mama-heart. This summer marks the end of my time as at-home mommy of wee ones. .. no more toddlers, no more morning cartoons, no more daytime playdates. I could meet a friend for lunch. I could go shopping by myself. I can even launch a writing blog that has been on the back-burner for years. special ways we embrace . . .
Here’s to all your transitions, changes, and ebbs and flows of all of life’s blessings. I’m certain God is with you along this journey. Thanks for the kind words, Mom! Thank you . . . for being one of my champions, Alyssa! I adore you, friend! Sweet Marci - Thanks for leaving a comment! I feel really overwhelmed by everyone's love today. You hold a treasured place in all the Hunter hearts - our special nanny/friend/helper/sister - we are so thrilled with your "bun in the oven" and can't wait to meet her! I'm excited to walk with you as you embark on the journey of motherhood yourself. You are going to do great! Beautiful and touching. Lots of love at your house. I'm looking forward to my next opportunity to visit. Thanks for the sweet comment, Dad!